2. To come to completion; end. A concluding action. 3. Attainment or arrival at the highest pitch of glory. Retirement /  n. 1. Removal or withdrawal from service, office, or business. found in the extensive description below. over 150 Blade Runner remixes. release has been made available. are black, thus mirroring Ridley Scott's vision of a futuristic Los Angeles. can be found on the inside of the box. Please see the photos. Retirement Edition. Also many other unreleased tracks have been remastered. Trilogy releases and was used for the Animoid Row scene in the movie. on any other previous Blade Runner score is a track entitled "J.F. also has improved sound quality. • "One More Kiss, Dear" now is the original unaltered version. • "I Am The Business" has been extended and contains better sound quality. Blade Runner Trilogy (entitled "Desolation Path"). and cut down in length. 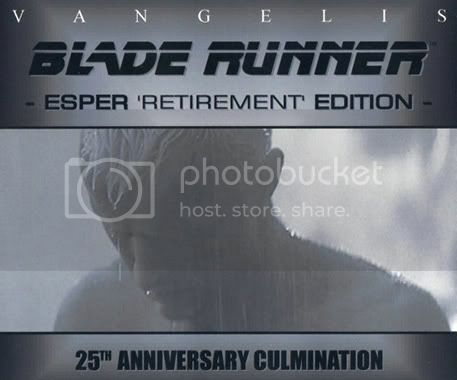 be found on the Blade Runner Trilogy have been remastered as well. close your eyes and you are immediately transported into the film. like watching the film without anyone talking). each other to create an enjoyable suite. To close the disc off there are a selection of bonus tracks. sound quality than any other release that contains this version. Ancient Temples". Here is the album version of "Bicycle Riders". of "If I Didn't Care" can also be heard. Sound of London's "My Kingdom" and Cosmic Baby's "L.A. 2018". just remixes the disc does include the Workprint version of "Tears in Rain"
along with 4 Blade Runner trailers. format as well for all the people who prefer lossless, uncompressed music. the best sound quality and mix of music possible. and with the emergence of new bootlegs claiming to be "Esper Productions,"
have quite simply, stolen our "label." the idea of lucrative gain being derived from these kinds of fan projects. ten? It was always meant to be a homemade project. secretly very flattered- we'd also like to take this moment to "de-mystify"
releases, etc), 1982 video, 1992 directors cut and construct something fresh. almost entirely from the BR game, with Vangelis stuff layered in the back. thought a logo of the Esper machine would make an original pseudo trademark. fans for fans. It was created out of love for Vangelis' music, not money. Vangelis' enigmatic score. All the music is here in chronological order. discs, mirroring Ridley Scott's vision of a futuristic Los Angeles. "Prologue and Main Titles" is featured, incorporating superior sound quality. and is played here in its full original 7 minute recording. "Dangerous Days"
and "Wounded Animals" are also complete and in their best ever sound quality. scratch so it does sound very different from the previous three "Esper"
"I WANT TO SEE A NEGATIVE BEFORE I PROVIDE YOU WITH A POSITIVE."